Hide & Drink's Leather Sunglasses Case is handmade by expert artisans using beautiful Full Grain Leather, providing your favorite shades with a secure and stylish home, protecting them from everyday scratches, dents and knocks. Made with high-quality Full Grain Leather, the Leather Sunglasses Case is durable and sturdy, and will attain an attractive patina with time and usage. 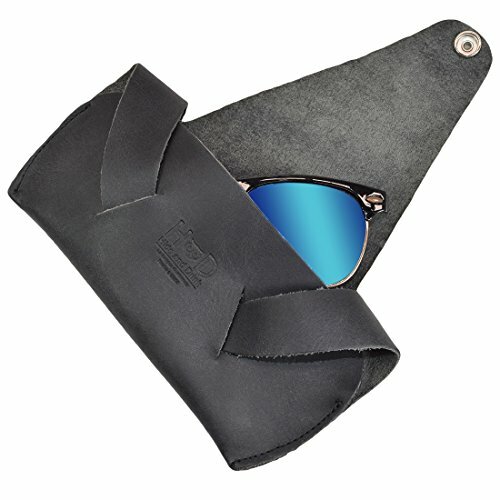 Perfectly providing a snug home to your Aviators, your Guccis, your Oakleys, whatever your style, the Sunglasses Case boasts a unique croissant design and a brass metal snap to provide a secure home to your sunglasses. No more scratches on your favorite lenses. HANDMADE FROM SOFT & ATTRACTIVE FULL GRAIN LEATHER: Hide & Drink's Foldable Sunglasses Case are hand cut and handmade by expert artisans from Pastores Guatemala, and provide and elegant, unique home to your favorite pair of sunglasses. Full Grain Leather is the best leather that money can buy, so if you want to provide your expensive sunglasses with appropriate protection from scratches, bumps and knocks, then look no further. ATTRACTIVE, SLIM DESIGN: The Sunglasses Case will fit your favorite sunglasses, providing a snug fit. The attractive croissant design ensures that you can wrap up your glasses securely, and the thick yet supple leather provides ample security from knocks, scratches and dents. Easy to store away when it's cloudy, and closes securely with a brass metal snap. FINELY STITCHED AND DURABLE: Hide & Drink's Leather Sunglasses Case is made with Full Grain Leather, the best grain of the hide. The use of this particular grain ensures that the Sunglasses Case provide excellent protection to your expensive sunglasses, as well as lasting you a lifetime. The Sunglasses Case is finely stitched and any lose ends are burnt so that no unravelling occurs. HANDMADE FROM A SINGLE PIECE OF LEATHER: To ensure durability and longevity, the Sunglasses Case is hand cut from one piece of leather, and then finely hand sewn. The rustic design looks good and provides you with a stylish and classy way to store your favorite shades. MAKES A GREAT GIFT: Hide & Drink swears by its leather, and knows that this fine, rustic Full Grain Sunglasses Case will make an excellent gift for friends, family and loved ones. Handcrafted by expert artisans, this Sunglasses Case is made to last and will make a thoughtful, long lasting gift for anyone and everyone.